A ticket and work order system that eliminates headaches. and lets your clients know you’re on the job. OrangeQC’s simple ticketing system helps keep everyone on the same page about what needs to get done. Every ticket tracks a task to be done or a problem to be solved. Assign corrective actions to the right person and update the status so everyone’s in the loop. Comments keep all communication around an issue in the same spot—but you can also get ticket alerts, make comments, and respond via email, too. 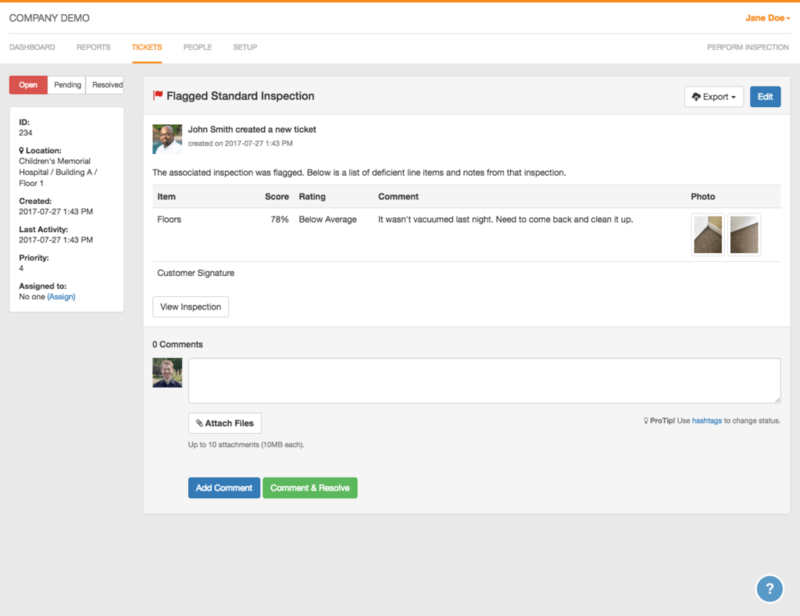 Our system can automatically create a ticket whenever an inspection uncovers an issue to fix or a customer emails a work order to your team. It also notifies everyone who needs to know. Custom alerts ensure that every corrective action gets done fast. We also automatically crunch the numbers and identify trends based on your inspection scores. Sort by site, inspector, and more to see exactly how things are going. Then, follow up with your staff about what’s going well and what needs improvement. You’ll have the data to back you up. Your team works in real time, so OrangeQC does, too. No more calling staff about an issue and waiting for someone to pick up, no more emails sent to the one person who’s on vacation, no more after-work phone calls from clients checking in on an issue. Everything’s updated, and it’s all in the OrangeQC app.